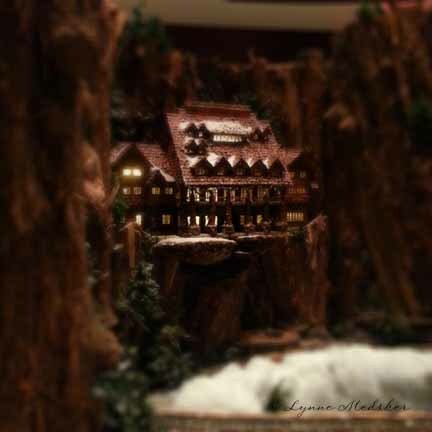 ‘Tis the season for…well, some holiday inspired pics! I went with a friend to the Eiteljorg Museum to view a wonderful photo exhibit a few weeks ago. 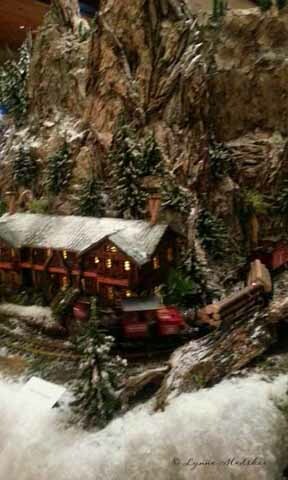 While we were there we also made a stop at their annual “Jingle Rails” exhibit. What fun!! The entire (large!) 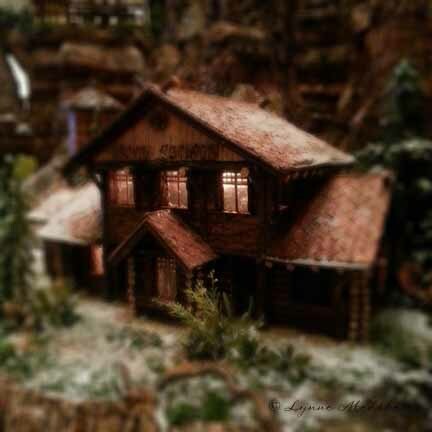 room was full of miniature buildings and different model train set ups. 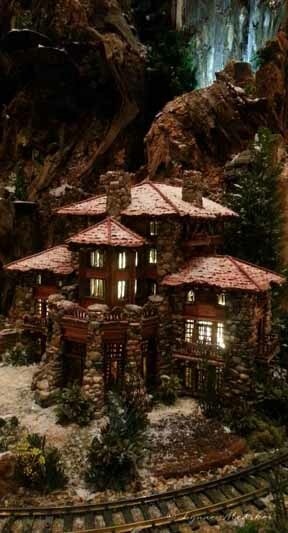 Since the museum focusing on the art of the western United States most of the lovely buildings were small replicas of lodges and other gorgeous sites from that region. I hadn’t anticipated taking any photos on our excursion and was caught at a rare time I didn’t have one of my cameras on hand. 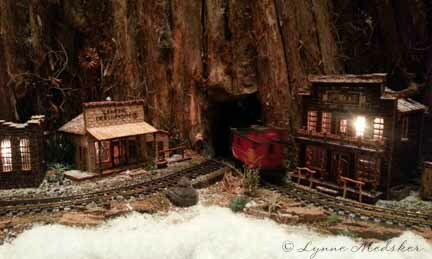 Along with the wonderful western scenes they also had a section that represented Indianapolis. 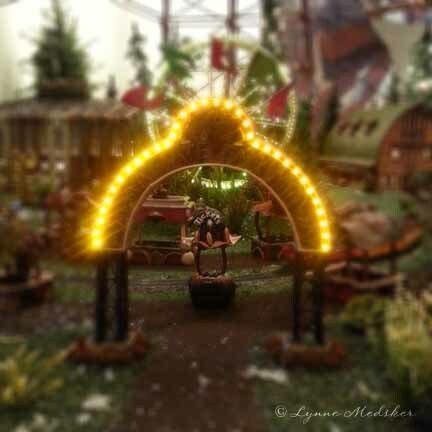 One section showed the state fair midway – which you don’t usually get to see in the wintertime! 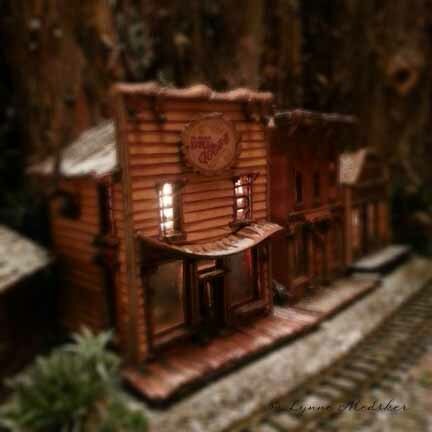 It was fun to see our town in a small scale! There was a larger section featuring downtown buildings and landmarks. 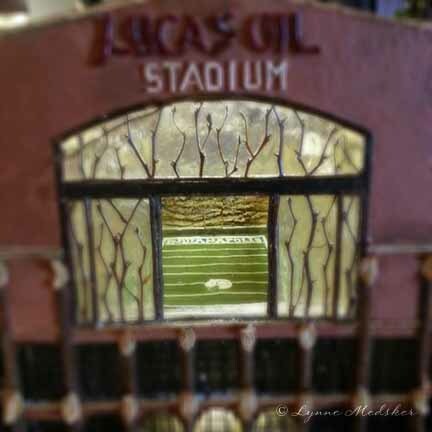 They even had a small version of Lucas Oil Stadium, home of our Colt’s football team. 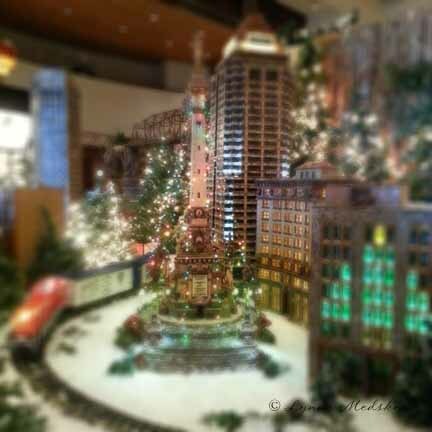 I think my favorite had to be the miniature “Christmas Tree” that is constructed each year by stringing lights on the monument in the circular center of Indy. 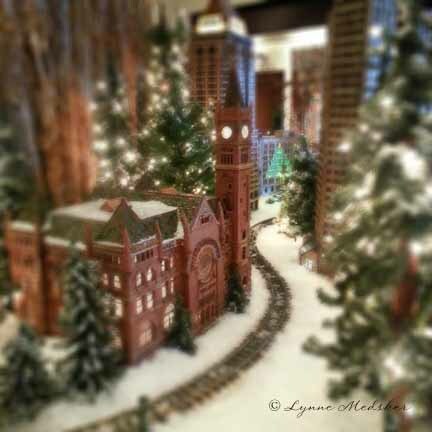 I hope you enjoyed this wintery tour of the exhibit and that you are enjoying the holiday season! PRESS RELEASE: What are you doing the weekend before Thanksgiving? Come have fun at the Garfield Park Arts Center! 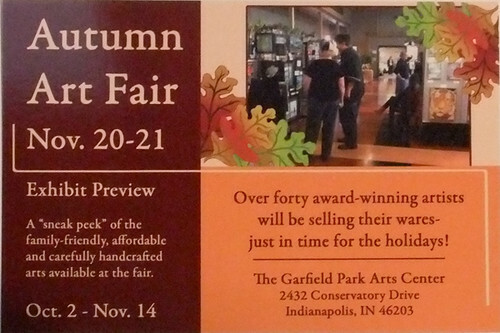 Indy Parks and Recreation proudly presents the Third Annual Preview Show and Autumn Art Fair at GPAC. Free to the public, both the Preview Show (currently on display in the lobby) and the Autumn Art Fair focus on exquisitely hand-created, family-friendly, affordable items (50¢ -$500) from about 60 artists. Groups and individual artists from Indy, Brown County, and central Indiana are now displaying their unique wares of all kinds at the Preview Show. These items and more go on sale at the Autumn Art Fair at GPAC on Saturday and Sunday, Nov. 20 & 21, from 10 a.m. to 5 p.m. Sign up for door prizes! The building is handicapped accessible. Other well-known area artists are back. Ceramicists Rick “The Pearman” Greiner and Sean Gray will be demonstrating their art. Mike Rogers, GPAC’s “poet laureate,” has an original poem on display. John Jarvis brought a tooled and painted leather Native American Medicine Wheel. Marti Icenogle’s unique monotype is “Chinese New Year.” Proudly “Eagle” by Mike Taylor surveys the scene. A speckled blue sugar and creamer set by Christine Heisler makes you crave tea. “West Washington Street” is Steven Keller’s offering. “Little Blond,” a charcoal portrait sketched by Charles Ver, encourages you to have a sketch done at the fair. Pam O’Rouke and friend Anne Kominowski have photos and cards for sale. The photo of fine jeweler Megan Martin’s “Butterscotch Drops” glows golden. An opaque yellow slumped glass vase is from Muncie-area artist James Tharp. Currently planned special guests include Faten Ali-Munger’s dancers, Manual High School’s Choir, and the Garfield Shakespeare Company. Come for the fun! Experience the extraordinary art for sale. 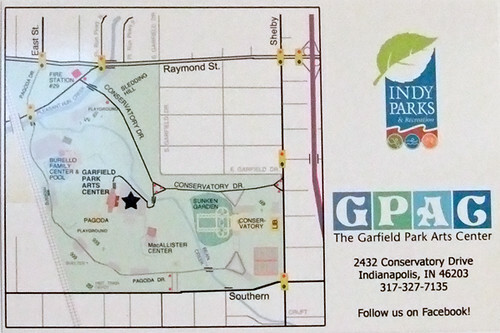 There’s plenty of free parking at the Garfield Park Arts Center. Call 327-7135 for hours and info. 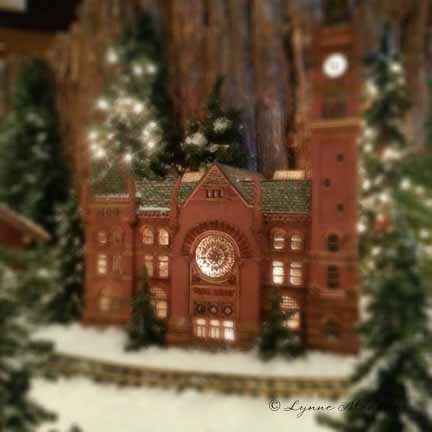 Check us out on the Garfield Park Arts Center’s Facebook page! Come See Art from the Heart in the Heart of the Park! Have a little class, won’t you? Or, have a big class – I’d be happy either way! If you haven’t checked out the recent updates on my website lately be sure to visit it soon. If you haven’t noticed, I always recap what’s been updated on the front page to help you navigate. One of the biggest changes is in the “Classes” section of the site. I really do enjoy sharing my love of art with others but have difficulty figuring out when and what to share. SO, for the fall sessions I am going with a “build it yourself” style of classes. 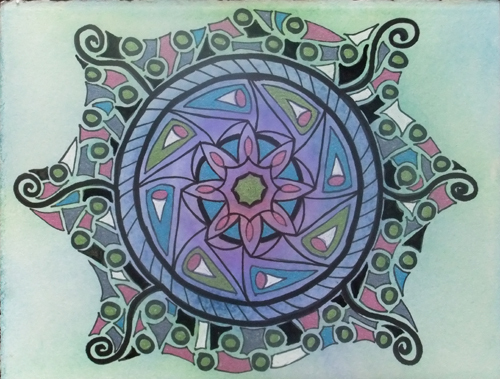 The topics available are: Gelatin Prints, Intuitive Collage, Mandala Art, Mixed Media on Illustration Board and Mixed Media Wall Sculptures. (You can find details, costs & links to examples of each of these topics on the Classes page of the website.) Also listed on that page are dates that I am currently available to present those topics. Pick a topic, choose your date, grab a friend or two and we are set for a few hours to an entire day’s worth of fun! Sign up soon to be sure you get the date you want…I’m ready for you! First Friday at Studio 204 in the Murphy Art Center! 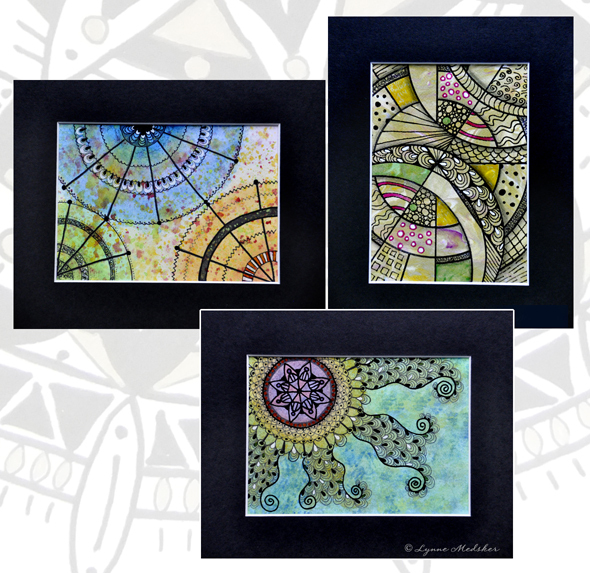 Studio 204 is pleased to be hosting the mixed media artist Lynne Medsker for the August First Friday on August 6. Studio 204 is home to Marti Icenogle (Magickal Dragon Designs) and Bob and Moon Stump (Mixed Media Jewelry). 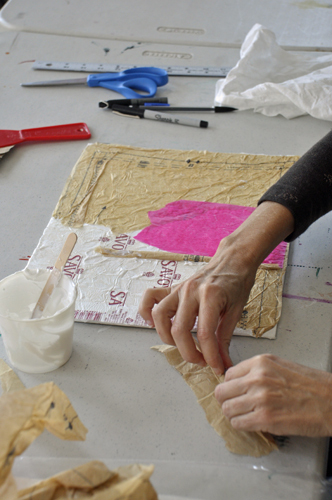 Studio 204 is located in the Murphy Art Center at 1043 Virginia Avenue in Fountain Square on Indy’s southside. 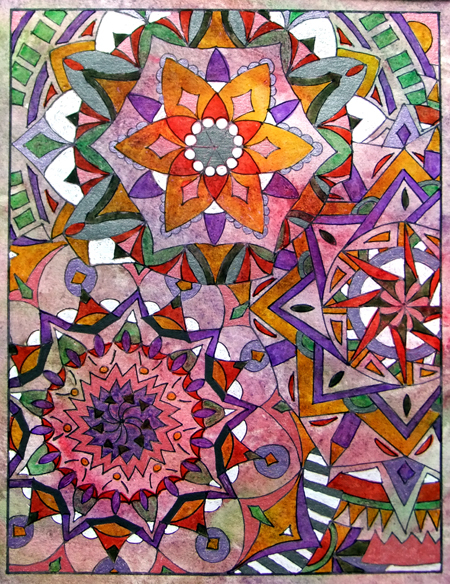 Lynne Medsker’s mixed media artwork is being featured on First Friday, August 6, 6 – 10 pm at Studio 204 in the Murphy Art Center at 1043 Virginia Avenue in Fountain Square. 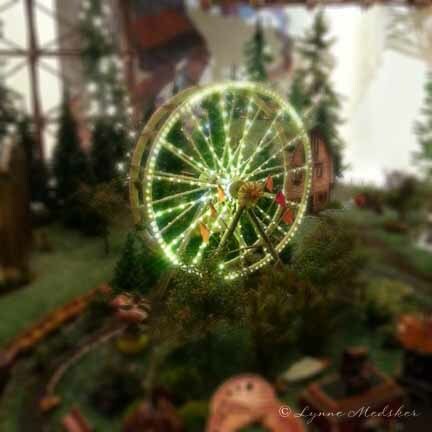 Lynne combines her digital images with photography, watercolor and mixed media collage. 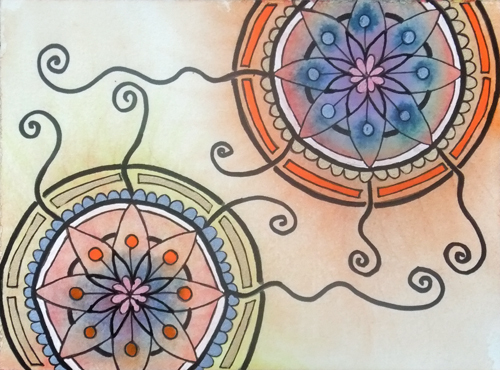 Lynne is especially intrigued with texture and blending individual elements into unique multi-layered images. She often uses recycled and natural materials in her works. 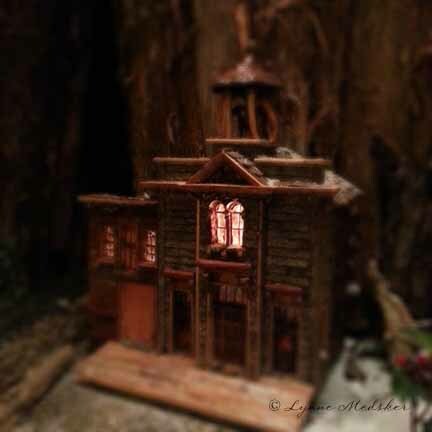 Lynne is an accomplished artist who has shared her artistic vision in numerous local venues. Additionally, her work has been shown in a dozen states across the U.S., including exhibits in Cincinnati, Chicago, Washington D.C., Phoenix and New York. She also has art in corporate and private collections. For further information about this exhibition or other events at Studio 204, please emailmarti@magickaldragondesigns.com.